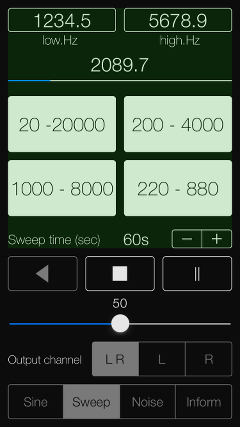 "ATG - Audio Tone Generator" is a high quality Audio Signal Generator application for iPhone, which creates the Audio Reference signals as Sinewave, Frequency Sweep, White Noise and Pink Noise. 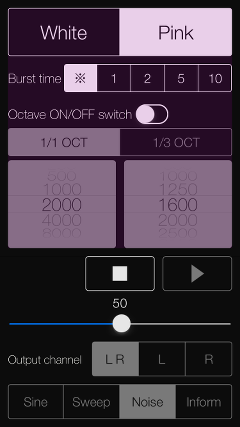 This app is an advanced version of "Audio Tone Generator Lite" app. It will help you to make the benchmark for your audio equipment and loudspeakers, your listening environment and room acoustics or your hearing. 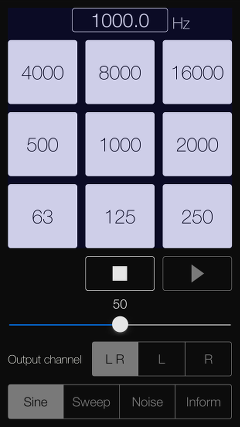 The signals created by this app can be best used in conjunction with external devices, such as an audio spectrum analyzer or a sound level meter. In addition, by having you to use it in conjunction with our Real-time Audio Analyzer, it can be easily measured the frequency response of your Audio system. 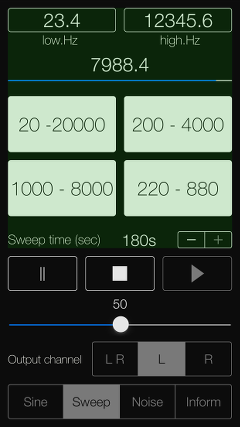 Please use this app as the standard pink noise signal generator. 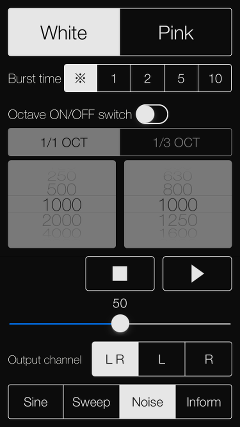 Please to click the following link to download "ATG - Audio Tone Generator" from App StoreTM. It will be open the download page on App StoreTM. Recommendation :　Requires iOS 11.3 or later. In the control area, you can select one operating mode from Sine-wave mode(Sine), Sinewave sweep mode (Sweep) and noise mode (Noise) and Information view (Inform). In addition, you will be able to control the playback volume, Play/Stop and Output channel. 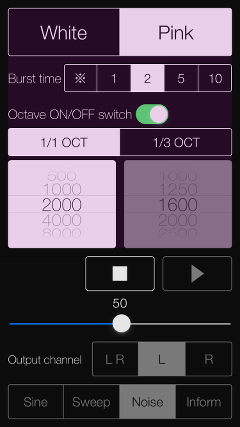 If you touch the frequency display monitor, it is possible to use the keyboard. In keyboard input, you should set a frequency of 21kHz from 20Hz. It should note that the initial value is not entered at the application startup, you will need to be set the frequency of up to one decimal place. 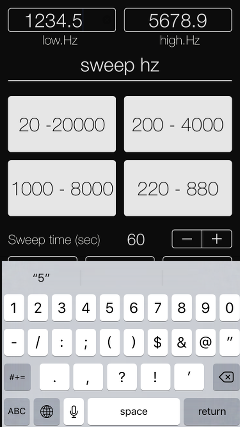 This mode is used to generate the frequency sweep signal. It generates a sinewave of transitional frequency continuously in the frequency range of 21kHz from 20Hz. 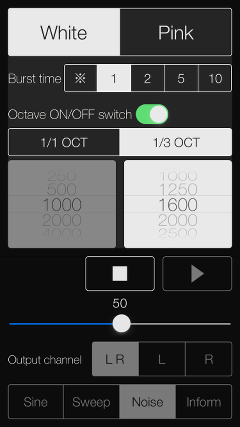 If you touch the frequency display monitor, it is possible to use the keyboard. 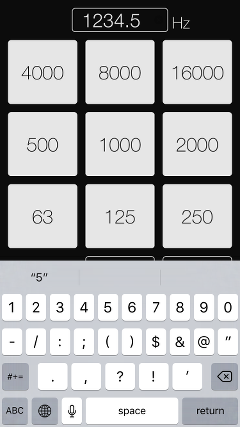 In keyboard input, you should set both the upper and lower limit frequency. It should note that the initial value is not entered at the application startup, you will need to be set the frequency of up to one decimal place. In addition, you can set the frequency of the two types by tapping a preset button. 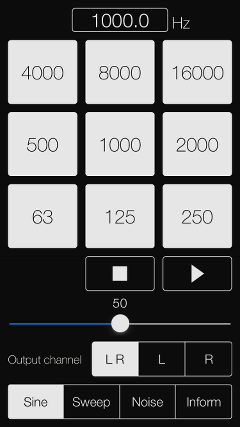 There are two PLAY buttons that can be generated rising sweep and downward sweep. 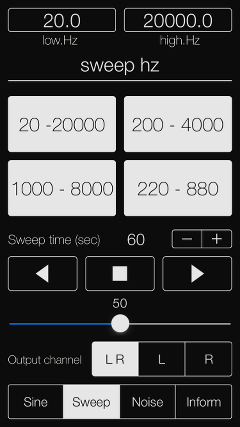 Generates a tone signal sweep by PLAY button, and then sweep on 10 to 180 seconds by setting of "Sweep time" . Default time is 60 seconds. It stops the generation of tone signal by STOP button. During playback, PAUSE button (II) is displayed, you can suspend when you tap it. If you want to resume, please tap PLAY button again. Note that you can not change the setting of frequency and sweep-time in the paused state. Further, if you want to reset the paused state, please tap STOP button. By tapping "Inform" button, it is displayed the product information and the usage. If you tap "Support/Information", Safari starts and you can see our support page. If you return the operation, please tap the other Mode button. ATG version 5.0 was released on October 10, 2018. ATG version 4.0 was released on April 11, 2018. ATG version 3.4 was released on November 29, 2016. ATG version 3.3 was released on March 9, 2016. ATG version 3.2 was released on January 6, 2016. ATG version 3.1 was released on November 22, 2015. ATG version 3.0 was released on November 17, 2015. ATG version 2.0 was released on November 5, 2014. ATG version 1.0 was released on April 8, 2014. Please fill in your review by accessing from iTunes or iOS device.